This past weekend was pleasant with great weather after the incessant rains last week. We met up with friends for dinner on Saturday and on Sunday the hubby and I went on a winter shopping spree. Well, Winter is nowhere in sight at least here in the South, but all we needed was a reason to shop. After all the shopping we were ravenous by dinner time and I wanted to make something that would hit the dinner table asap. 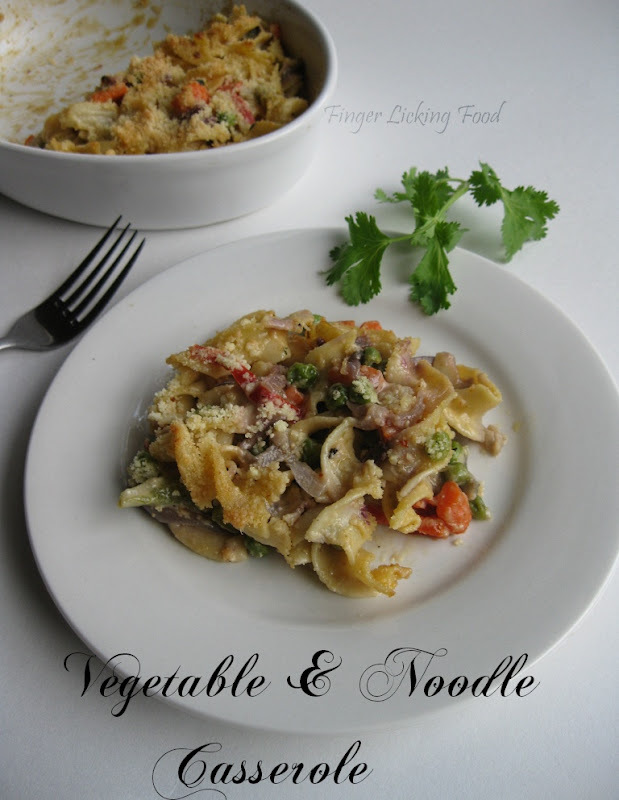 I had a pack of Egg Noodles which I had bought very long ago, and I had fresh veggies on hand. Put the two together in a creamy sauce and you have one delicious casserole. Prepare the sauce – Heat the butter in a non stick pan. When it melts add the flour and whisk continuously while cooking on medium heat. Cook for 2-3 minutes and then whisk in the whole milk and heavy cream. Bring to a simmering boil. Season with salt and nutmeg. Turn off heat and set aside. Cook Egg Noodles according to package instructions. Drain and reserve. Prepare the veggies- Boil carrots, peas and cauliflower till done, about 7-8 minutes. Drain. Heat the olive oil in a pan. Add the minced garlic, sauté till fragrant. Add the sliced onions and peppers. Cook till onions are translucent and peppers are soft. Add the chilli flakes, and boiled veggies. Combine and then add the fresh herbs, the prepared sauce and egg noodles. Season with salt. Cook for a minute or two and transfer to a lightly buttered casserole dish. Top generously with the parmesan cheese. Bake for 15 minutes till the cheese is brown and bubbly. Serve hot. The Egg Noodles were light and with the veggies made for a not too heavy meal, but enough to satisfy two very hungry people. 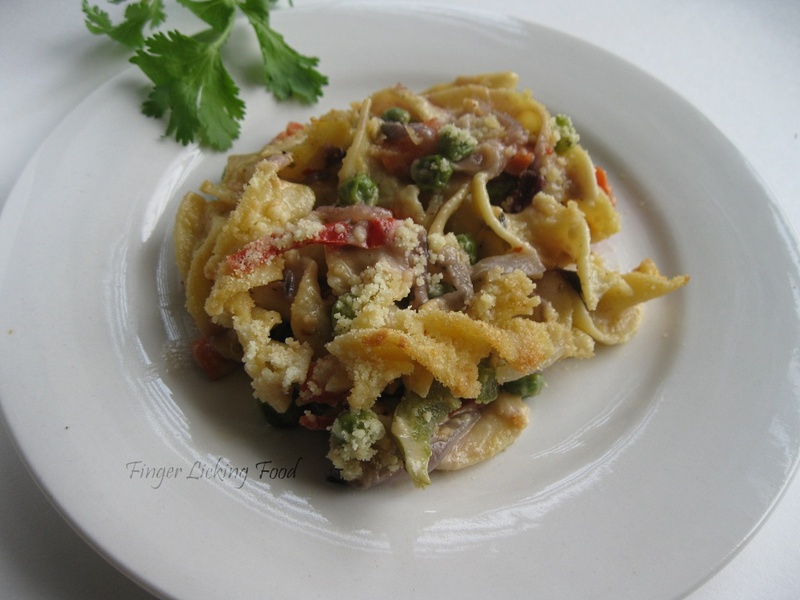 If you are not big on Egg Noodles, you can substitute with any short pasta like penne or farfalle. lovely dish and a wonderful picture. Yummmy recipe Namrata. we make it with macaroni but noodles in caserole is new and looks really inviting. must try it out. Hii..Namrata..Yesterday I had fusilli pasta with creamy sauce..it came out pretty good!! !& I had used exactly same measurement..but without nutmeg..